Are you a device developer who has wished to build a device that has almost all the features of a smartphone? KiteBoard is your best bet! Kite is an exciting new entrant to the Single Board Computer world. 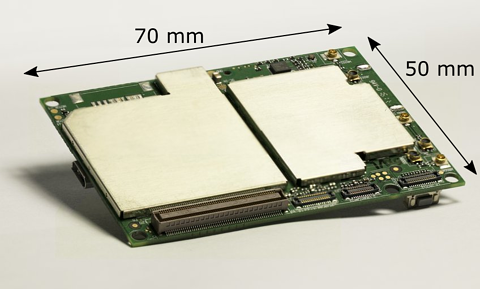 Kite is a standalone module that includes complete connectivity and high performance in a small battery powered form factor. With a sub-credit card size of 70mm x 50 mm, and a low profile (8 mm height with all connectors), Kite is small enough to build custom devices quickly. Kite aims to brings the mobile ecosystem into the hands of developers. Kite is best visualized as the heart of a smartphone. Remove the casing, the display, battery, antennas, cameras & audio; everything that remains is on Kite. Kite makes it possible for everyone to build devices that include high-speed LTE connectivity. WiFi, Bluetooth and Bluetooth Low Energy are available too. Best of all, Kite is battery powered, and sips power, just like the cellphones you use every day. Kite provides a stable, high performance, low power core around which you can build your own device. It is based on the field proven Qualcomm MSM8916 SoC, which has been used in millions of smartphones. Kite includes a lot in a little; the complete specs of the board are available in the Specifications page. IPX connectors are provided for RF (LTE/3G/2G), WiFi/BT, and GPS. You can choose the antennas as required for your device. The integrated high current charger supports LiPoly batteries from 1000 mAh to 6000 mAh and beyond. The board can work with off-the-shelf batteries. Kite can also be powered with a 5V DC input. Separate connectors are provided for up-to 2 cameras and a MIPI display. UART/I2C/SPI and plenty of GPIOs are available on the expansion connector. A single USB OTG port is available as well. Kite runs Android natively. If you have already developed applications on Android, then there’s nothing new to learn. All the peripherals work as expected. Pop in a micro SIM card, apply power. Kite will be on the internet running Android in a few seconds. No configuration required!